Vermont Rustic Wedding Photography is enchanting in any season. This Vermont Rustic Wedding Photography was taken during a fall wedding at the Quechee Inn at Marshland Farm. In the image the bride and groom are enjoying a stroll around the grounds of the quaint Vermont inn and farm. Around them, autumn is in full swing. Trees have changed colors and leaves have dropped from their branches. 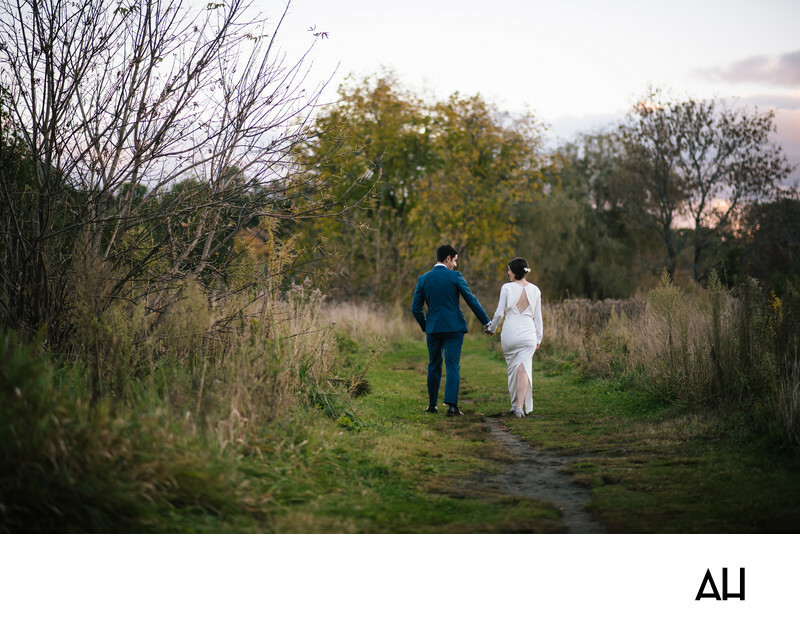 The newlyweds tread down a worn path that winds around the venue’s estate. They walk hand in hand, with smiles spread across their faces. As they walk they gaze at one another, adoration and joy radiating from their expressions. The groom wears a stylish blue suit, and walks with a bit of a skip in his step. He is overflowing with gratitude and love, ready to move forward on this path with his new wife. The bride wears a simple, yet incredibly chic wedding gown. The dress is ivory with long sleeves and a high neckline. The back of the dress is open, with a clasp at the nape of the bride’s neck, and there is a slit that travels up from the ground to just above the back of the knee. The grass around the couple is beginning to brown as the air has become cooler and the season shifts toward winter. The mostly-bare tree branches reach up toward the sky as the day turns to dusk. In the right of the image one can faintly see the sun setting behind those branches, signaling the end of a beautiful Vermont wedding day, and the beginning of a wonderful marriage.